In the lands far up above our current one, when the world was still new, a single entity came into being. He was born old, with a long beard, and a wrinkled face and a tired, but kind, smile. Leaning on a spear, he looked across the Celestial Plains of Heaven and knew that it was his duty to create living beings to inhabit all plains. Slamming his great spear, Yada-no-Yari, the Eight Span Spear of Creation, into the ground, the God, En'no-gyoja, became the God of All Creation. From the power in the spear came beings, born from blades of grass and drops of dew and pebbles that covered the grounds of the pristine Heavens. Hundreds of thousands of spirits, Gods, and Celestials. But not all spirits were good, not all Gods were good, and not all Celestials were good. In fact, many of them were disruptive, and evil, and disagreed with the leadership of En'no-gyoja. So they banded together, and rebelled against En'no-gyoja, but the wise old God would not have this war mongering in the Plains of Heaven and his banished these rebels into the deepest reaches of the realms below the oceans on the Earth below and named the land Yomi-no-Kuni. And so with the evil beings gone from Heaven, all Spirits, Gods and Celestials who remained lived together, happily and peacefully for a thousand years, under the rule of En'no-gyoja. After living together for centuries, the Gods and Celestials learned to love, and often they bore children who were either Celestial or Demi-Gods when they bred together. But for the first time, new children appeared amongst those of Celestials and Gods. These children were come to be known as the Moon Tribe, or the Lunar Celestials. They drew a majority of their power from the moon, and were a hybrid of God and Celestial. They were extremely powerful, extremely intelligent, extremely strong, and developed technology far beyond the understanding of the Gods. Theses Lunar Celestials soon realized the disdain and hatred other Gods and Celestials had for them, and rebelled against En'no-gyoja and the other Gods. The war was long, as both sides were equally matched in power, thus a century of fighting erupted across the lands of Heaven. Until finally, En'no-gyoja and the Gods decided that they had had enough, and the fighting and dying could go on no longer. They found the proper solution for the Lunar Celestials. They banished them to the Moon, and forced them to live there for all eternity where they would be all powerful, but would be unable to fight anyone but themselves. And so the Lunar Celestials became nothing but a name in history of the Gods, and the Gods returns to millennia of peace. In the beginning, all life existed with the gods. For generations, gods lived in the realm of the gods, Takai-ten-no-tentai-heiya (Celestial Plain of High Heaven). Gods, male and female, lived and loved in their own realm, unaware of the lands below Hoshi-no-kawa (River of Stars). One day, while observing the festival the great Creator God of All, En'no-gyoja, the two gods, Kanatta and Ameria, respectively met within the fields of celebration in their realm. Instantly smitten with one another, they married, but were in content with living in the heavens. En'no-gyoja, in his infinite kindness and wisdom, granted full control of the realm below the heavens to Ameria and Kanatta, in the condition that they would construct, govern and watch over the world below as if it was their own child. They agreed, and so En'no-gyoja granted them Yada-no-Yari (Eight Span Spear of Creation). Standing upon the Tenchi-kyo (Heaven and Earth Bridge), Ameria and Kanatta parted the stars, sky and clouds, grasped the spear and stirred the muddy, salt water of the lands below the heavens. As they lifted the spear, the salty mud that dropped from the tip formed into landmasses. The two gods continued this until the world had turned in full rotation, covering it with landmasses that spotted the Earth, and finally covered it in forests and wildlife for everyone to enjoy. Before they left Heaven, En'no-gyoja granted the Spirits he had created thousands of years ago, leave to go with Ameria and Kanatta and inhabit the lands before. Then, together, the two lovers descended to Earth to an unnamed mountain. Ameria and Kanatta then had several children together, and Ameria birthed several gods and goddesses. From the loins of Ameria burst forth: Takamagahara, F'yr, Adeza, Cutae, Ilyd, Cae, Sceter, Laedaela, Elounli, Tans, Aelounath, Kaleck, Ryz, Mar, and Ghoa. After birthing the gods, Ameria soon birthed the Spirits that govern the world, such as Tui and La, the Ocean and Moon, The Elemental Spirits, Koh the Face Stealer, the Mother of Faces, and many more. Then, she gave birth to the Caretaker Spirits and the Demi-Spirits, such as the Four Horsemen Spirits, and the Spirit of Luck. Shortly after their creation, around this time, Tui and La, the Ocean and Moon Spirits, assumed mortal forms as two koi fish, and decided to inhabit the barren and remote Spirit Pool in the Northern Water Tribe. After all Gods and Spirits were born and unleashed upon the world, Ameria and Kanatta began to govern all that there was, as promised to them by En'no-gyoja. They were in dispute as where to build their new kingdom and for many long years, their people and children searched the world with them to find just the right place. It was not until Kaleck, God of All Knowledge, suggested that they pick the land in which they first descended from Heaven. Agreeing with their son, Ameria and Kanatta picked the mountain where they descended upon the world, Ameria and Kanatta and the Gods and Goddesses built a magnificent palace. But before they could move in and enjoy their lives as rulers of Ashihara-no-Nakatsukuni (Central Land of Reed Plains), the dark beings that had been banished to Yom-no-Kuni thousands before--and had been released when the land had been created, attacked the gods and spirits alike, corrupting some of the spirits to become dark and evil spirits. Before the gods could send the evil back to whence it came, casualties were suffered, among them was Ameria, Goddess of Death. As a side effect of living amongst the conditions and atmosphere of the land they now ruled, several of the gods and spirits lost their immortality, as signified by their deaths. Angered, and pained by the loss of his wife, Kanatta swore he would get her back and bring her to life once more as Queen of All Spirits. Before completing this quest, he established the kingdom for all their kind. With the help of the other gods, he brought a veil of safety down upon their land, to keep evil demons and creatures from attacking them once more. The veil caused the land to be plagued by eternal twilight, in exchange for ultimate safety, where evil could not tread, and dark demons could not survive. Kanatta, upset at the loss of his wife, searched the world far and wide for an entrance to the underworld. A place where all things, dead and immortal and divine, went to die and rot; Yomi-no-kuni. Kanatta finally found the answer after searching a thousand years, in a land far from where he set up his kingdom, a small island he called Kamui. Kanatta, having searched information from the libraries of the lands of heaven, had found the entrance to Yumi-no-kuni, sitting at the edge of Lake Laochi. With the Spear of Creation in his hand, Kanatta ventured deep into the bowels of the Earth. What he saw made his stomach turn. Demons, evil beings, fallen deities and spirits all together, lost, forlorn, forsaken and forgotten. But Kanatta pushed forward, determined to find his lost wife. Kanatta searched and searched until he finally found her, sitting within a great palace in the ground surrounded by brimstone and fire. Inside, he sat, shadowed and darkened, unable to be seen, as a long, kaya curtain blocked her and her attendants from view. Kanatta begged his wife to return with him to the land of the living, and Ameria, after getting permission from the spirits who guarded the gate, agreed. But she commanded her husband wait for her, as she would need three days to prepare to leave. She also bid he not look at her until they had both left the underworld together. Kanatta agreed, thinking this was reasonable a price to pay for the return of his beloved wife. So Kanatta slept there, on the other side of the curtain, in the entrance hall of the palace. For three days and two nights he silently waited, his back to his wife, waiting till he could finally bring her home. But on the third night, when all of Yomi was asleep, Kanatta became curious, wondering why he could not look upon his wife. Impatient and missing the times when he could see her face, and so he peeked behind the curtain to see his sleeping wife. But Kanatta was surprised, instead of the beautiful face he remember, it had been replaced by the face of a demon. Kanatta screamed in fright, disgusted by his wife's new face, and Ameria woke. Angered that her husband had disrespected her wishes, she transformed into a horrible creature of demonic origin and design. With the whole of Yomi and Ameria behind him, Kanatta ran from the caves of the underworld, killing all who stopped him. When Kanatta reached the entrance, he used the Spear of Creation to create a barrier until Daidarabotchi, a great and giant god, whose footprints created ponds and lakes, came to help him seal away Yomi from the world forever. Dairdarabotchi, large and strong as he was grabbed the two nearest mountains, the twin peaks of Ezofuji and slammed them down upon the entrance, sealing it for good before returning to sleep in the center of Mount Vulmai. As Deidarabotchi returned to Mount Vulmai, his foot created the lake at the base of Ezofuji, Laochi Lake. Before being sealed away forever, Kanatta swore to create beings which he would rule over, and they would be responsible for keeping Ameria sealed away in Yomi. Ameria screamed out to Kanatta, that she would kill 1000 of those beings a day and as the populations grew, she would increase the number until they were all wiped out. Adamant, Kanatta claimed he would allow the births of 1500 people per day to combat her anger, and would allow that number to grow along with Ameria's. Saddened by the loss of his wife and impure from the dark air of Yomi, Kanatta went to Laochi Lake, and washed his face in the water to purify himself. His tears mixed with the water, and as they dripped into the soil. As Kanatta was a god, and gods could give birth to other beings from any part of their body, three beings were born. The first was Gedo Mazo, the Great God and King of all Spirits as well as a man, and a woman. The man and woman were not divine or gods, but they were not quite men. They were part man, part beast, and due to their divine origins had a strong connection to the spirits. Recognizing this, Kanatta created more of them, and tasked them all with keep Ameria and Yomi sealed away. He left the man and woman in charge, Ka and Mui, for whom Kamui is now named, in charge of the tribe, whom he called Oina. The Oina were trained in the arts of spiritual magic, and were taught to use their spiritual connections to connect with elemental spirits, known as Kami, to combat evil and demons. Then, Kanatta turned to Gedo Mazo, and told his son that he would return to the land of heaven, and that it would Gedo's job to rule the land of divines, the Oina and all gods and spirits. The Gedo took this task to heart and accepted it, and Kanatta ascended back into heaven, leaving the Spear of Creation with his new son, and left the world of man forever. From here on in, Ameria became the Goddess of Death, and Kanatta that of Life; and so marked the beginning of life and death for all mortal things. Gedo Mazo returned home, and spoke the words of their father to his siblings, the other Gods and Goddesses agreed with their father's decision, and from his new throne, Gedo Mazo granted each of his siblings a dominion to rule over as Gods of that respective dominion. To Takamagahara he gave the Sands, to F'yr he granted Fire, to Adeza he gave Air, to Cutae he gave Earth, to Ilyd he gave Water, to Cae he gave Harvests, to Sceter he gave Conflict, Laedaela he gave the Hunt, to Elounli he gave Love, to Tans he gave Music, Aelouanath he gave Marriage, to Kaleck he gave knowledge, to Ryz he gave Light, to Mar he gave Darkness and finally to Ghoa he bestowed Trickery. When all roles were given out, the gods departed, but not all were happy with their new roles. Sceter, feeling betrayed by his father for being passed over for his youngest sibling, thought he was the strongest, wisest and best suited to be leader. He did not like his new dominion and he did not agree with being a servant of his brother. Angered, but remaining silently, Sceter did as he was told, but did everything he could to anger his family. He was loud, impetuous and rambunctious. When he hunted, he would uproot forests and destroy farms. He often killed spirit servants and attendants for displeasing him, and he would argue with his siblings daily. Finally, fed up with their sibling, the gods and goddesses cast him out of their protected Kingdom and out into the world. For many years, Sceter travelled around the world until once more he ended up at Kamui, like his father. When he reached the southern parts of Kamui, he met a lonely family of fishermen who were being plagued by a demon that lived in a nearby cave. The mother and father, aging and getting old, were distressed, and Sceter asked why. The old parents explained that the demon, Yamata-no-Orochi, an eight headed dragon demon who had moved in several years prior, allowed the family to fish and live in and around the waters of the shore of Kamui in exchange for food. The old man explained that the food they were required to give Orochi was the flesh of a pure maiden. For seven years prior, the fisherman had given up seven of his eight daughters, and he was no down to his last child, and his last daughter. Saddened by this, the family was in distress for someone to save their only child left, but no one was brave enough to combat Orochi, except for Sceter. In return, Sceter demanded their daughter, Kushinada-hime, as a bride, as he had fallen in love with her at first sight. The old man and woman agreed, and so Sceter got to work at destroying the demon. The night before Yamata-no-Orochi's arrival, Sceter built an eight gated fence around the sacrificial altar, and from a nearby sake mill, he got the strongest sake he could possibly find. Sceter then returned to the village and turned Kushinada into a hair comb, then changed into her sacrificial white robes, and with his battle axe in hand, waited at the altar for the dragon. Yamata-no-Orochi appeared at midnight, when the moon shone full. As his eight heads entered the gates, Sceter used his powers to appear as Kushinada. He placed in front of each of the gates, a large urn of the strong sake, and allowed the dragon to drink. While they drank heartily from the urns, Sceter locked the heads in place in the gates. When the dragon finished drinking, he had drunk so much that each of the heads were now quite drunk and unable to fight. Sceter easily slaughtered the beast, beheading, skinning and bifurcating much of Orochi. As he sliced his blade down the tail, he discovered a sword, which he called Ame-no-Murakumo-no-Tsurugi (Sword of the Gathering Clouds of Heaven), a blade with the power to command thunder. After Orochi was dead, Sceter married Kushinada, and returned to the Kingdom of Divines. As a gift of apology, he presented the mighty blade he found in Orochi's tail to Gedo Mazo, and he and his wife were reemitted to the Kingdom. However, Sceter's return was not to last. Years later, Gedo Mazo and Sceter entered an argument together. Sceter claimed there needed to be more gods to help the current ones rule over the world, while Gedo Mazo argued that more goddesses were needed to help the gods reproduce and create more gods. Kaleck was brought in, and with his infinite wisdom, knew that he had to get his two brothers to see eye to eye. Hoping that by swapping the roles both gods would fulfill the needs of the other, and realize the arguments of the other and thereby, come to understand one another better and end the fight. Kaleck took Gedo Mazo's sword and Sceter's jeweled Magatama necklace. Sceter was given the sword and was told to chew it up and spit it out, and from the pieces would be born more goddesses. To Gedo Mazo, Kaleck gave Sceter's jewel necklace, and was told to do the same as Sceter with the sword, and create more gods. Both did as instructed, and five new gods and goddesses were created from this. However, the two could not agree over who would command which new deity, as Sceter claimed that it was his necklace that had birthed the gods, and so he wanted command over them. Gedo Mazo argued that it was his sword that created the goddesses, and so he wanted command over them. Neither could agree upon a solution, so they fought. In the end, Sceter was once more cast from the Kingdom, and in spite, created his own realm in Yomi, becoming the de facto ruler of the underworld too, second only to his mother, Ameria. Building a magnificent castle for him and his wife, Kushinada. Here they would live for all eternity to come, never to return to the heavens or speak with the gods anymore. Though, growing bored of life in Yomi, Sceter returned to the surface and lived amongst the Oina and the Benders of Nippon; Benders he created of his own free will. Sceter, having returned to the land of Nippon and Kamui of his own free will, took it upon himself to act as his father's successor of the land and guard it from those who meant it harm. He often protected it from demons and evil, along with his two sons, an Oina chief, and the First Emperor of Nippon, both whom answered to Sceter. Together with his two sons, Sceter taught the Oina how to fight evil spirits that leaked from Yomi every so often and seal them away in Bronze Mirrors, with the help of their Magatama Cords and their Exorcising Swords, and he taught the Energy Benders to bend the energy within themselves, and later the benders of Light, Dark, Fire, Water, Earth and Air to bend their elements as well. And for thousands of years, all was right in Nippon, and the land flourished under the rule of Sceter. The gods, after the expulsion of Sceter, return to the land of the heavens to be with their kind. At the advice of Kaleck, they begin to see they no longer have a place among the mortal world, as the spread of non-divine races means the world is slowly becoming theres, for the gods only to rule from afar. Furthermore, Kaleck points out that constant divine intervention will not teach these peoples independence or self-strength, thereby making them too dependent on the gods. The Gedo Mazo, realizing this, tells his siblings to return to the heavens, and he shall create his own Ruler Spirits to take their places as rulers of the Land of Mortals, and govern the beings Gedo Mazo places on the Earth. The gods agree, and Gedo Mazo gets to work creating the spirits. He created, in order, Galamoth King of All Spirits, Aeon Spirit of Time, Raum Spirit of Time, Sakusei Spirit of Creation, Sukasai Spirit of Destruction, Seikatsu Spirit of Life, Korosu Spirit of Death, Kad Spirit of Fire, T'kura Spirit of Earth, Enyyles Spirit of Water, Aelakas Spirit of Air and finally Drearr Spirit of Chaos. After creating these sons and daughters of his, the Gedo Mazo got to work creating a new form of being. Working long and hard on a large massive, continent, the Gedo Mazo created beings known as the Ancients. Long living beings with extremely high intelligence and far more technologically advanced than any of the other peoples on the Earth. He divided these Ancients into 12 Clans and took, from each clan, the strongest of the bunch, 6 males and 6 females. He gave them the ability to regenerate instantly upon death, and gave them each a mate for life. Making them the constant protectors of the Ancients. But Galamoth had a different idea. Wanting control of the world for himself, and highly disliking anything his father, the Gedo Mazo, created for fear they would be loyal only to him, Galamoth created the first humans and proceeded to slaughter as many Ancients as he could, but not before Gedo Mazo could hide as many as possible away on the Island of the Ancients, hidden from the world and the gods, placing each of the heroes into a cryonic sleep until the time was right. Angered that his father would hide the Ancients, Galamoth murdered his father with the rest of his siblings assisting him and left his body to rot in the Spirit World, meaning to return to the Ame-no-Murakumo-no-Tsurugi, his father's heavenly sword, and the Yada-no-Yari, the Spear of Creation. Unable to locate the remaining Ancients, Galamoth raised storms across the Earth, hoping to seek out the Island of Ancients, and found nothing. Naturally, Galamoth assumed they were all destroyed and that the so called, Island of Ancients was no more than myth, and so began to populate the land known as the Six/Four Nations with humans, and let them build a pantheon around him and his siblings. After this, and the fight with their father, the Great Spirits, children of Gedo Mazo, were tired and weak and entered into deep sleep. Meanwhile, Sceter had heard of his nephews tyranny. Angry for the death of his brother, Sceter entered the Spirit World, turned his brother's body (Gedo Mazo) into a Wooden Statue with many of the same powers as he had in life. He also took the Ame-no-Murakumo-no-Tsurugi and Yada-no-Yari, and spirited them away to Nippon. Around this time, Sceter, back in Nippon, gave his son, an Oina Warrior, the power of Spirits, to help defend himself and the people of Nippon from Galamoth and his destructive warpath. This aged, but powerful Oina chief, who took the form of a massive lion--a rarity amongst his people, as they only take the forms of the Animals Spirits of their land--was made the first Spirit King, and given control over the Gedo Statue, the Yada-no-Yari and the Ame-no-Murakumo Sword, as well as all spirits on the face of the Earth. The Spirit King was watch over a second, but parallel world to the current one, where only Spirits would inhabit, but govern both equally, only reuniting them the day when he saw fit, leaving the world to the Spirit King and the new benders. Around this time, several humans traveled into the Spirit World to live. Hoping to learn more from the benevolent spirits who watched over them, they left behind their human ways and became beings unlike any other. Despite historical evidence of the first band of humans splitting into two--one half heading into the Spirit World--extensive searches in the Spirit World for the Kingdom set up by these humans have turned up nothing. This tribe of humans have been come to be known as Spiritborne. It has also been held to legend that the Old Gods corrupted their first mortal servant at this time. It is said he was known as Xaxas, the first to bear that cursed title, "The Betrayer." He is supposely locked away in the Spirit World, trapped forever for his transgressions against humanity and the balance. One day, when he least expected it, a large metal and stone ark fell from the heavens and landed in the middle of Laochi Lake, instantly sinking--for the most part--beneath the waves. However, upon closer inspection of the Ark by the Oina and Sceter, the door burst open and from it came the stench of evil and death. Looking inside, the Oina could see that it was filled with the dead bodies of many. Ancients who had been in hiding from the onslaught of Galamoth in heaven, deities from the lands and heavens above, celestials from the lands by the river of stars, and many of the Moon Tribe who once inhabited the white orb. Sceter looked around the ship and had learned, through a diary entry of a young Moon Tribesman, what had happened on this ship. Everyone on this ship had sought refuge from a terrible war that had unfolded in Heaven. Not much could be discerned from the ruined diary, but what else Sceter learned was that all aboard found themselves overwhelmed by demons mid-flight, and before they could land safely and escape, the demons appeared from the belly of the ship and massacred everyone on board. Sceter decided this is what caused the ship to crash here in Laochi Lake, but not seeing any monsters, assumed they were preparing for another ambush. Sceter instantly ordered the Oina to leave the ship immediately, hoping to seal it away, but before he could escape himself he was attacked by the demons within. While in the bottom of the Ark, Sceter battled the demons and eventually came face to face with the ultimate evil. The King of All Demons. Sceter pushed the demon back, weakening him by stabbing him with Kutone, the sword Sceter had used to kill Yamata-no-Orochi many years ago, and escaped the Ark, closing it off to the world forever. While the damage could not be reversed, as many demons had escaped unto the world from the Ark during the fray, Sceter had kept the ultimate evil locked away for eternity. On that day, however, a blood pact was formed between the Oina and Sceter and the Ultimate Evil. Sceter made it so that every time a demon was expelled or exorcized, its soul would return to the Ark to be trapped inside. However, each time this happened, the Ultimate Evil would absorb the soul of the demon, and become even stronger, one day becoming strong enough to open the seal and the Ark and wreak havoc on the world, and only those with the bloodline of Sceter and the Oina (a descendant of Sceter and Kushinada) would be able to stop him. The Oina became the hunters of these demons across Nippon, and would become responsible with the maintaining of the seal on the Ark of Yamato. Sceter left the Oina with Kutone, his sword used to seal the demon, and left it as a beacon as the Ultimate Demon Killer. He said to them that "When Kutone glows silver, the time for the bane of the Ultimate Evil will begin, and the blood of my blood shall return to put him down again" before disappearing back to Yomi once more. The Oina agreed, and so began the covenant of the demon killers, the Oina. The First Avatar was brought into existence by Sceter before he left this world for good, using his own son, the then First Emperor of Nippon's benders as the shell in order to fulfill the covenant and blood pact in the future. Sceter's son was given control over all six elements, and was given his Avatar State being the Avatar's access to his godly powers. 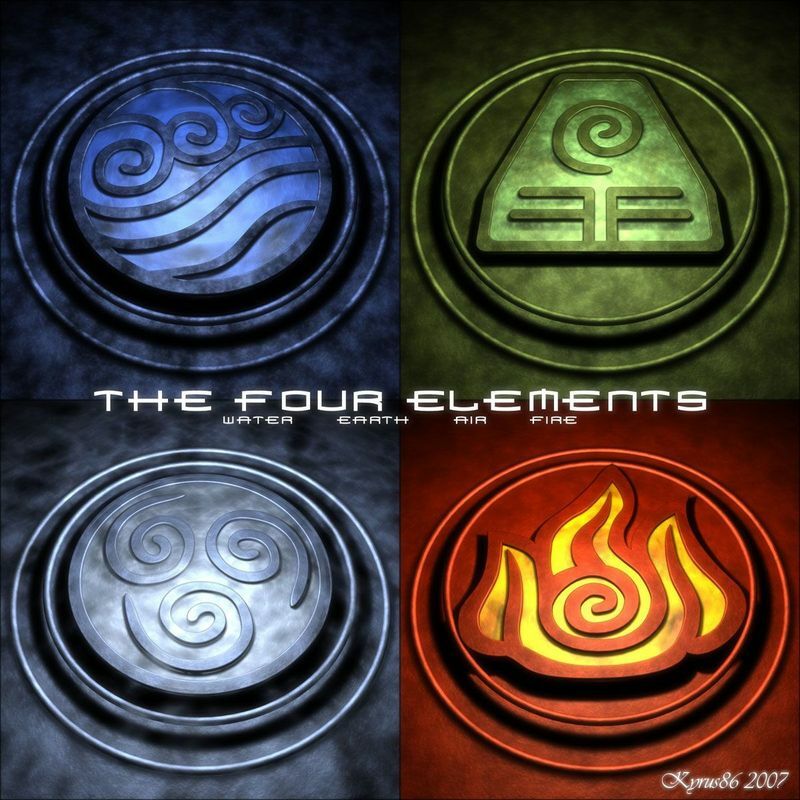 In one last final moment, Sceter knew he needed a fail safe in case Avatar wasn't enough, and so he created the Warriors of the Elements. The strongest bender of each element was selected, and chosen as a companion for the Avatar. They would reincarnate like the Avatar, but would only surface or "activate" in times of great calamity. After having ruled for thousands of years a semi-mortal being, the Avatar left the throne, and protected balance in all of Nippon for the next forty years, only to be reborn again after his death forever more, thus beginning the Avatar cycle. In the forty years he had as the Avatar, the son of Sceter decided to help the people defend themselves from the demons that now plagued the land, and so began the start of bending as we know it, organizing the ability to bend into art forms, and martial art styles. The six ancient forms of bending were then born. They were: the Wing-Chung of Water, the Shotokan of Fire, the Tae Kwon Do of Earth, the Capoeira of Light, the Muay Thai of Dark and the Shaolin Kung Fu of Air. Shortly after, bending began to spread across the land of Nippon, Sceter created thirteen more gods and entrusted them to watch over the new benders when he was gone, in order to ensure they did not fight amongst each other when the Avatar was not available to make peace. He also made them the guardian of some of the strongest bending techniques known so far. He then took fifteen of the strongest Benders in Nippon and turned them into Gods. Modeling them after the masks which the Oina wore on their faces. Sceter thus created Yomigami the Dragon, Amegami the Wolf, Tachigami the Rat, Nuregame the Snake, Gekigami the Tiger, Bakugami the Boar, Hasugami, Tsutagami and Sakigami the Monkey Trio, Yumigami the Rabbit, Kabegami the Cat, Moegami the Rooster, Itegami the Ox, Kasugami the Sheep, and Kazegami the Horse. This was the last time Sceter personally intervened with the humans or Oina again, and thus ended the era of the Gods and began the time of man. The Avatar became the means of peace amongst the benders and Oina, helped by the thirteen bending gods. Much later on in history he would become the Bridge Between the Worlds after meeting the Spirit King, and forsake Nippon for the land of the Four Nations instead, but always ready to return incase the Ultimate Evil ever broke free. Lord Magmaros, originally the Dragon Lord of Volcanoes, Lava and Fire, was corrupted against his Dragon Lord allies and the Spirits he served alongside. Corrupted by the Old Gods. The second of the mortals corrupted by the Old Gods, Magmaros raised beings of flame and fire. Spirits of the flame. Dragos of the flame. Beings of magma. Beings of wickedness and evil. He called this army, The Burning Legion. Their mission was to destroy the world. Burn it all to ash and cinder. Burn it to death and destroy it so the Old Gods can take over and rebuild the world in their image. The Spirit World rose up against him. Every being of Spiritual Energy battled the Burning Legion, locking Magmaros and his followers away deep beneath the Earth in the volcano now known as Ilmaryd. This battle caused tremors all around the world. This caused the cryogenic tank, where the remaining Ancients were secretly stored millennia ago. Awoken by the battle without their knowledge, the Ancients lived their lives under the protection of the Gedo Mazo's shield over their island. Since then they have lived and died, trying to create and existence for themselves. - The Energy or Chi Benders as they were also known, eventually divulged into two branches, Light and Dark Benders. The two peoples remained at peace with each other, while also keeping their Chi/Energy Bending. Eventually, they began to mutate once more. Dark Benders began to have children who were not only dark benders, but children who were Earth and Fire Benders as well. Whereas Light benders began to have children who were Light, or Water, or Air Benders. - At some point, following a civil unrest, the Water Tribe – which was originally centered around the North Pole – splits into two groups: one stayed at the North Pole, while the other group went out to settle the South Pole. Relations with their sister tribe were later healed, and the two tribes would gather together at annual New Moon celebrations. - At some later point, a larger group of waterbenders from the Southern Tribe, who were wandering through the Earth Kingdom, discovered the Foggy Swamp and, comfortable with the large amount of water there, decided to stay, forming the Foggy Swamp Tribe. The Southern Water Tribe never learned of this offshoot and the Foggy Swamp tribe itself forgot its own origins. The world after Fire Lord Ozai was peaceful and prosperous, and remained so for several hundred years. 400 years of peace was spent rebuilding and picking up the pieces, and the Fire Nation redeemed themselves with a long line of good, and generous kings from the line of Zuko. In the year 396 AO, the Fire Nation went through a crisis known as the Ikko-Ikki Wars. A group of religious cult of zealots and extremists who entice everyday people in joining, rioting, burning, looting and dying for their cause. These were the Ikko-Ikki. Known as the Ikko-Ikki Sect. Led by Grand Abbot Kennyo, or Kosa, they raised rebellion across the Fire Nation, based in their two main fortress temples, Ishiyama-Hongan Ji on Mount Tenchi. And Ise-Nagashima Temple in the provinces. Fire Lord Honno-ji, enraged by the radical rebellion, sent his son, Nobura, and grandson, Nobunaga to put down the rebellion. While Nobura died while battling the rebellion, Nobunaga made a name for himself as a cruel and ruthless general to his enemies, but a kind, wise, cunning and charismatic leader to his allies. By 397 AO, much of the Ikko-Ikki Revolt had been contained to their two temple fortresses, and by the end of the year Nobunaga had destroyed the Ikko-Ikki completely. First he laid siege to their support line temple, Ise-Nagashima, burning down all allied towns and villages and outposts along the way. Once Ise-Nagashima was burned, and the warrior monks there slaughtered, Nobunaga turned his attention to the main temple, Ishiyama-Hongan-ji. Nobunaga descended upon the mountain like a typhoon. While the temple stood at the top of the mountain, Nobunaga marched his armies up the sides, burning the every tree, patch of grass, and any settlement found along the way. In the three days it took to reach the top, Nobunaga set the entire mountain ablaze, and finished with the temple. By the end of the Ishiyama-Hongan-ji Siege, Nobunaga had killed all 10,000 Warrior Monks of the Ikko-Ikki, Abbot Kennyo, and 20,000 men, women, children and allies. Mount Tenchi itself burned for seven days and seven nights, appearing as a burning beacon in the capital. The mountain became a symbol of warning to all future dissenters and any remaining members of the Ikko-Ikki still out there. Since then, the Fire Nation has remained peaceful, and dissent has been next to none. New kingdoms were discovered. New kingdoms inhabited by benders who bent the elements of Light and Dark were discovered (The Light Kingdom and Dark Nation) and the all the world became one of peace and prosperity. The Nations currently live in peace. But things are not going to remain that way. Unbeknownst to the nations, a new threat lurks in the shadows. And a new land is about to be discovered.